Oil and Democracy in Cuba: Going Towards Nigeria or Norway? With news of the possible presence of offshore oil within Cuban waters, USGS (2004), hopes were raised that substantial amounts suitable for commercial exploitation would be found. Two of the exploratory wells drilled by Scarabeo 9, an especially-built drilling platform for deep water exploration in Cuban waters, under contract to international oil companies Repsol and Petronas yielded no substantial amounts to be exploited commercially. PDVSA and Sonangol are next in line to drill wells using Scarabeo 9, but afterwards this platform is under contract to drill in Brazilian waters, see Orsi (2012). Since there are other blocks beyond the ones leased to the companies mentioned above for exploration, the Cuban government will continue to hope that substantial amounts of oil suitable for commercial exploitation can be found even if the wells being drilled on behalf of PDVSA and Sonangol also fail. And, of course, this bonanza may eventually happen. This paper points out some of the challenges and opportunities faced by Cuban policy makers in the event of the discovery of substantial commercial oil deposits. These challenges and opportunities will be both economic and political. Furthermore, these two dimensions of social processes interact with each other in ways that are not fully understood in general or in these particular circumstances. We will proceed by drawing the main implications of the literature on both the economic natural resource curse and a more incipient political natural resource curse for the Cuban setting. One way to do so is through the rhetorical exercise of asking whether Cuba is more likely to approach the Norwegian experience, which is viewed as relatively successful in both dimensions, or the Nigerian experience, which is viewed as relatively unsuccessful in both dimensions. In both the political and economic realms, we will note the main indicators of success or failure. First, we discuss the economic natural resource curse and subsequently the political natural resource curse. Our analysis concludes with a brief assessment of likely outcomes in the Cuban case. One version of this curse became popular in the development literature under the term “Dutch Disease.” It describes a situation where exploitation of a natural resource leads to an export boom that distorts the real exchange rate generating domestic inflation and difficulties in exporting other products. Often the outcome is low growth and unemployment. This phenomenon was initially identified after the 1959 discovery of natural gas in Holland, but it applies in principle to the consequences of any sudden increase in foreign exchange availability from a natural resource. Geological fortune is not destiny, however, and policies to combat domestic inflation and place the increased foreign exchange abroad have been discussed in economic development texts, e.g., Perkins, Radelet and Lindauer (2006, pp. 675–83). Indeed, the Norwegian Oil for Development Initiative has training programs on technical, environmental and economic aspects of managing oil. Young Cuban professionals have begun to participate in some aspects of this program (verbal communication from Vegard Bye of the Norwegian Institute of International Affairs at the ASCE 2012 meetings). Unfortunately, knowledge of these issues, while eminently desirable, is not enough to prevent the outcome of the curse. The more recent literature, which is nicely reviewed by Torvik (2009), has identified a number of indicators that are associated with whether or not countries are able to avoid this curse. Below I discuss briefly the two most important ones in my opinion. First, consider the “resource adjusted savings rate” that countries experience during exploitation of a natural resource. This adjustment is particularly important in the case of non-renewable natural resources such as oil. A standard definition of income in economics, e.g., Hicks (1939), is the maximum amount one can consume without affecting one’s wealth. Since oil is fully depleted through its sale, the income generated by oil exploitation reduces one’s wealth by the same amount. In the national income accounts, however, the income generated through oil sales is implicitly treated as implying savings are zero, when in fact they are negative. Obtaining the true savings requires an adjustment to the national income accounts subtracting the net extraction of oil during the period. This allows calculation of what Matsen and Torvik (2005, Table 1) label “resource adjusted savings rates” for resource-abundant countries. Second, the level of institutional quality has been identified as a determinant of whether the positive or the negative economic effects of a natural resource discovery are realized. In this literature, institutional quality is viewed in terms of property rights protection and levels of corruption. These two dimensions provide incentives or disincentives for the private sector that lead to the exploitation or neglect of productive investment opportunities. Indeed, using crosscountry data Mehlum et al. (2006) found that this effect not only exists for natural resources in general but it is more pronounced for oil and minerals. The oil boom in Norway starts in 1969, and that nation’s adjusted savings rate averages 17% per annum between 1972 and 2000. By contrast, Nigeria, whose oil boom started in 1970, had an adjusted savings rate averaging minus 22% over the same period. Similarly, using the Transparency International corruption index as a measure of institutional quality, we find that Norway’s score is 8.6 out of a maximum of 10 in 2010, ranking as one of the top 10 countries out of 180 evaluated. By contrast, Nigeria’s score is 2.4, with a country ranking of 134 out of 180. Whereas Norway’s economy has experienced a stable moderate annual growth rate since the start of the boom, Nigeria’s has experienced great variability, including rates over 7% and well below 0%. Norway has avoided Dutch disease while Nigeria has experienced a classic case. Nigeria’s outcome has been attributed to policy choices when compared to Indonesia, Pinto (1987). Of course, there are substantial differences between these two countries that can also have an impact on this differential outcome of an oil discovery. Among the most important ones for our purposes are population size and heterogeneity as well as the initial level of income when a major oil discovery takes place. In Cuba’s case its initial level of income and the heterogeneity of its population are closer to Nigeria whereas its population size is closer to Norway. More to the point, however, Cuba’s unadjusted savings rate, measured as gross capital formation/GDP, prior to the flow of any offshore oil, is already low, ranging between 9.2 % and 13.5% in the period 2000–2006, Mesa-Lago (2008, Table 1). This makes its adjusted savings rate likely to be close to zero, since no allowance is being made for the depletion of the current oil exploitation or that of its nickel resources. Its score on the corruption index for 2010 is 3.7, with a country ranking of 69 out of 180. From the point of view of the effect of institutional quality on economic outcomes analyzed in the literature the score on the index is the relevant measure. It places Cuba far closer to Nigeria than to Norway. Oil and other sources of non-earned income are viewed as mechanisms that can affect democratic outcomes, inducing what one might call a political natural resource curse. Two different mechanisms have been pointed out in the literature that can generate undesirable outcomes of this type. A most obvious one is pointed out by Tsui (2011), who argues that large amounts of total oil wealth provide incentives for political leaders to monopolize power over the state in order to maximize the rents that accrue to them directly. 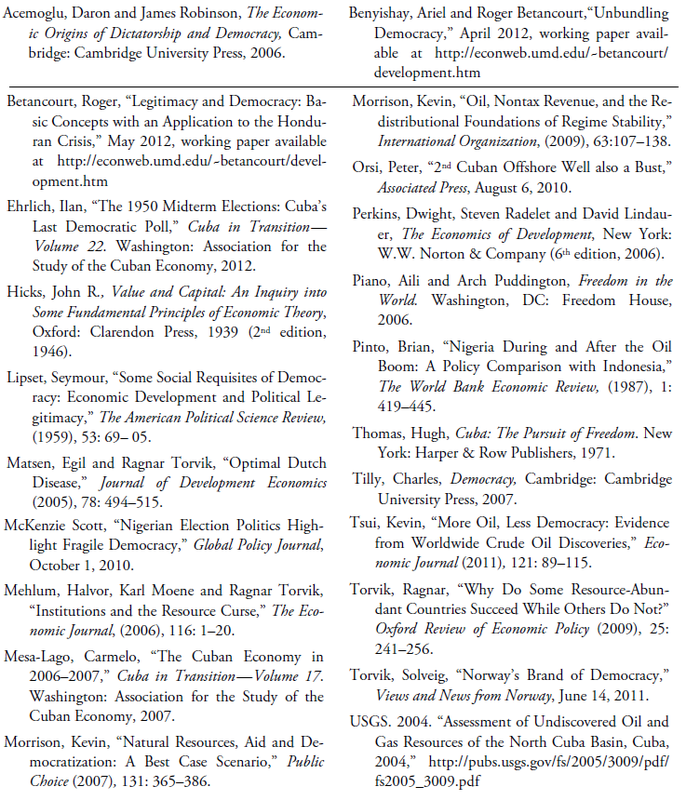 He provides empirical evidence that countries with large endowments of oil wealth as a result of oil discoveries have systematically lower levels of democracy in terms of the political rights available to their citizens. While there are issues of reverse causation between oil production or even oil wealth and political rights, Tsui’s reliance on the measurement of endowments of oil wealth as a result of oil discoveries eliminates these concerns, or at least alleviates them as much as one can with crosscountry data. Therefore, it provides the most convincing evidence of a causal negative relationship between oil and democracy at this time. Other mechanisms that can generate a political natural resource curse are more subtle. One logical underpinning of these alternative mechanisms is Acemoglu and Robinson’s (2006) redistribution model of democratization, where rich elites prefer democratization to revolution by the poor. They are willing to tax themselves to provide benefits to the poor in order to prevent the confiscatory tax rates associated with revolutions. Democratization acts as a commitment device by providing the poor a mechanism for ensuring that the rich elite’s willingness to tax themselves materializes. In this setting, non-earned revenues from natural resources release the pressure of the class struggle over the tax rate and provide incentives for the elite to delay or reverse democratization. This argument assumes a non-democratic regime as its starting point. A theoretical model of various possibilities has been developed by Morrison (2007), who shows that even in the best case scenario, natural resources and aid diminish the prospects for democratization. With this mechanism, higher non-earned revenues per capita are useful to all regimes by promoting stability, because rents need to be distributed among fewer people, allowing elites to keep a higher proportion of non-earned income. This mechanism then implies an incentive for non-democratic regimes to remain or become more non-democratic, and for democratic ones to remain or become more democratic. Empirical evidence in favor of the idea that non-earned revenues per capita promote stability using panel data for a wide variety of countries is provided in a subsequent paper by Morrison (2009). More recent evidence by Benyishay and Betancourt (2012), however, can be interpreted as supporting the mechanism stressed by Tsui, but not necessarily the one suggested by Morrison. An important reason for this difference is that their analysis focuses on the impact on democracy measured in terms of political rights and civil liberties not in terms of regime stability. Their results are similar for both dimensions of democracy, i.e., they support the existence of a political resource case. Looking at Norway’s experience with democracy we find that it has been a constitutional monarchy since 1814 and a parliamentary system since 1884. Its political system would be described as a parliamentary democracy in the context of a constitutional monarchy. 2 It was in place long before the oil discovery in 1969. Meanwhile, Nigeria became independent in 1960, with a federal structure and other governance institutions developed under British colonial rule. It experienced civilian government in 1960-1966, a military government in 1966-1979, civilian rule in 1979-1983 and another set of military governments until 1998. It has been under democratic rule in a federal presidential system since 1999. It is characterized as a fragile democracy.3 The oil discovery in 1970 took place in the midst of a military regime. With respect to the stability of a political system at the time of the oil discovery, democracy in Norway seems far more stable than in Nigeria. Lipset (1959) argues that legitimacy is what gives political stability to regimes. Betancourt (2012) suggests that legitimacy is a stock variable which increases or diminishes over time as a result of good or bad governmental performance in various dimensions, especially through the provision of public goods and services. Hence, from this perspective, both Norway’s stability and Nigeria’s instability at the time of the oil discovery arise as a result of past governmental performance. For the first time, Freedom House chose in 2006 to provide scores on its subcategories for political rights and civil liberties, Piano and Puddington (2006). If we look at the scores for Norway on Freedom House’s subcategories of political rights for this year, we find that it scores at the maximum levels of 12, 16 and 12, respectively, with respect to the following: free and fair elections, political participation and pluralism, and efficiency of government in terms of transparency and accountability of the policies undertaken by political leaders. Nigeria’s scores for the same year and in the same subcategories are 7, 8 and 6, respectively. Norway scores on Freedom House’s subcategories of civil liberties in 2006 at the maximum levels of 16, 12, 16 and 16, respectively, with respect to the following: freedom of expression, freedom of assembly, rule of law and personal autonomy and individual rights. Nigeria’s scores for the same year and in the same subcategories are 11, 7, 4 and 6, respectively. Incidentally, Freedom House discontinued the practice of providing the disaggregated scores after 2008. Thus, if one looks at the details of the political system in terms of political rights and civil liberties thirty- some years after the oil discovery, democracy in Norway has attained a maximum level reflective of the judgment that it does not suffer from a political natural resource curse. Similarly, the scores on the details of the political system in Nigeria can be used as a measure of what is consistent with a country that suffers from the political natural resource curse. Just like in Nigeria, should the oil discovery in Cuba happen in the very near future, it will take place under a non-democratic regime. Moreover, past governmental performance in the provision of those public goods and services associated with a market economy casts doubts on the legitimacy and stability of the current regime. Both of these characteristics suggest a political resource curse similar to Nigeria’s, rather than an outcome similar to Norway in the political sphere. Some idea of how far Cuba would have to go as a fragile democracy if such a system were to emerge at some point, can be obtained by examining Cuba’s current scores on Freedom House’s subcategories for political rights and civil liberties. In terms of political rights, such as free and fair elections, political participation and pluralism, and effectiveness of government in terms of accountability and transparency, Cuba’s scores in Freedom House’s evaluation are 0, 0, and 1, respectively. In terms of civil liberties, such as freedom of the press, assembly, rule of law and personal autonomy and individual rights, Cuba’s scores are 2, 2, 1 and 2, respectively. There is no doubt that at this time Cuba is well below Nigeria and very far from Norway in these dimensions of democracy. Political science provides no reliable guide on how long it takes for these subcategories to change by one unit on a lasting basis. Nevertheless, considering the possibilities for both democratization and de-democratization as analyzed by Tilly (2007), quinquenniums and decades may not be unreasonable guesses for some of these subcategories, for example the rule of law. For other subcategories, however, change can take place quickly, for example the holding of free and fair elections as illustrated by transition societies after 1989. While the literature has not pursued the issue of how often both curses take place at the same time, casual empiricism suggests a likely association between experiencing economic and political natural resource curse. Nigeria is obviously an example, but not the only one. Venezuela and Argentina are other instances where the main features of the two curses seem to take place jointly, including for example inflation and governmental violations of elementary features of the rule of law and protection of individual property rights. If substantial amounts of oil were discovered through the current offshore deep-water exploration in Cuban waters, the rents generated would provide strong incentives for the current government to avoid democracy in order to appropriate these rents. Given the repressed consumption of the last decades by the majority of the population, the pressure to use the oil income to provide benefits to stay in power, along the lines suggested by Morrison’s arguments, would be great. Inflation is an almost certain outcome. The main uncertainty is whether it would be disguised or highly visible. In the former case, this could happen through the current dual monetary system or through manipulated figures, as in Argentina, or through both. A tradition of corruption under both earlier attempts at democracy, for example Ehrlich (2012), and the current Communist system, for example recent and frequent corruption trials, also suggests that both curses are likely to materialize. The need to use these resources to alleviate existing racial cleavages bears some similarity to the ethnic divisions underlying some of Nigeria’s economic and political problems. One possible mitigating factor in the pull toward these two outcomes is that the complexity of the technology for successful exploitation of the natural resource may provide limits or constraints on the other incentives. But that is a thin reed on which to hang one’s hopes for avoiding both curses. Last but not least, the literature has paid little or no attention to either the amount or the value of the natural resource necessary for either the economic or the political curse to materialize. In Cuba’s case, the average estimated oil reserves by the U.S. Geological Survey (USGS) are 4.6 billion barrels. Current estimated reserves for Norway and Nigeria by the U.S. Energy Administration are 29 billion and 16–22 billion barrels, respectively. Suppose the amount matters and a minimum range of 10–15 billion barrels must be available for either or both curses to take place. In that event Cuban policy makers would still have plenty of issues to worry about, including most of the ones discussed here, but not because either of these natural resource curses is befalling upon them! 1. I would like to thank Roberto Orro, the discussant of the paper at the XXII Annual Meetings of the Association for the Study of the Cuban Economy, for his comments. 2. For a recent commentary on its differences with the American system see Torvik (2011). 3. For a recent commentary on its nature see McKenzie (2010). 4. For a detailed and thorough account of most of this period see, for example, Thomas (1971).